Grasshopper activity has been high in many areas of Nebraska this year and wheat growers should be planning how they're going to manage this pest in seedling wheat this fall. Grasshopper populations decline through late summer and fall, but can remain in significant densities until after the first hard freeze. Adult grasshopper. Densities of 11-20 grasshoppers per square yard in non-crop borders can lead to significant wheat losses this fall. Large numbers of grasshoppers in areas surrounding wheat fields threaten seedlings as they emerge. Emerging winter wheat has limited foliage and grasshoppers can easily keep the wheat clipped back completely, causing stand losses in the field margins. Growers need to monitor grasshopper densities in areas surrounding wheat fields. Normal threshold densities should be lowered because of the damage potential. Densities of 11-20 grasshoppers per square yard in non-crop borders surrounding newly planted wheat fields may be enough to cause significant loss. 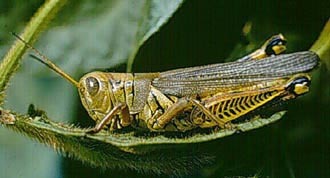 The potential for grasshopper damage decreases as we move into fall, but if grasshopper densities are extreme, it is difficult to eliminate damage. Several options are available to help reduce the risk of grasshopper damage in winter wheat and/or manage developing problems. Adjust Planting Date. Early planting should be avoided in areas of high grasshopper activity. Planting high risk fields near the end of the optimum planting window will reduce the time that a wheat field will need to be protected from grasshoppers in the fall. (For recommended planting dates, see Planting Wheat Too Early May Lead To Problems in the August 8 CropWatch.) Also, increasing the seeding density of wheat in field margins may compensate for partial stand loss and provide a reasonable post-grasshopper stand. Insecticide Application. If grasshopper populations in areas surrounding wheat fields are high, insecticide control may be necessary to reduce damage. Controlling adult grasshoppers is difficult. Options include: planting time application or seed treatments to field margins or treatments of surrounding borders to protect the wheat as it emerges. Furadan 4F is registered for use as a border treatment at planting under a Special Local Needs (SLN) label. The major drawback to Furadan is applicator safety. It is important to be aware of the safety precautions when using this product. Furadan should be injected through a closed system directly into the furrow through a microtube or with liquid fertilizer. This injection equipment is expensive, but will reduce safety concerns. Furadan provides protection for the emerging seedling and does not need water for activation. Gaucho and Cruiser seed treatments are registered for wheat. Plants are protected from the time they emerge and treatment can be easily limited to field margins to reduce costs. These treatments will be effective for moderate grasshopper densities, but likely will not hold up under severe grasshopper pressure. The seed must be treated by a certified seed treater so plan and order your seed accordingly. Also, to be effective the highest registered rate of product must be applied to the seed. Several foliar insecticides can be used to treat wheat for grasshopper control; however, there is little residual activity in the emerging wheat crop because there is little leaf area available for product deposition. The best option is to treat the field borders to prevent grasshoppers from moving into the wheat fields. If the surrounding area is a non-crop area, the best treatments to control adult grasshoppers would be Warrior (or other lambda-cyhalothrin products) and Asana (or other esfenvalerate products). If the area surrounding the field is pasture, the best products would be Warrior or Mustang MAX. Warrior is the only product that can be used in non-crop areas, pasture and wheat. To get the most residual control when treating field borders, apply one to two days before wheat emergence. Grasshopper control around wheat fields can be challenging and the level of effectiveness for any control option will depend largely on the density of grasshoppers. Under very heavy pressure, none of these control options will be completely effective, and the loss of some stand in the field margins may be inevitable. If grasshopper damage reduces stand in the field margins, these areas can be replanted later in the fall after the first hard freeze when grasshopper populations have declined. Grasshopper control in winter wheat will likely be a compromise between effective control and affordability.